Whale Trail is an awesome new game from Ustwo Studios. This app is available as universal download for iPad, iPod Touch or iPhone in the App Store priced reasonably at 99 cents. Whale Trail uses the tried-and-true gameplay mechanics from classic side-scrolling shooters and gives them a shiny new coat of paint. While this might sound like a bad thing, it really isn’t. Whale Trail’s presentation is top-notch and delivers a satisfying experience. Overall, Whale Trail provides users with a gaming experience that is incredibly unique. The mechanics of Whale Trail are fairly simple; players need to tap on the screen to make their whale protagonist fly. Applying pressure to the screen will make the character gain altitude, and releasing pressure will cause him to descend. 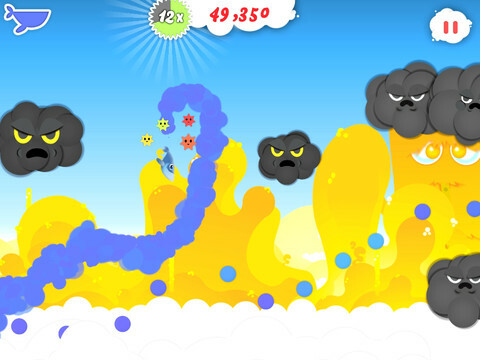 The player must guide the whale through the sky, avoiding any of the dark clouds that block their path. 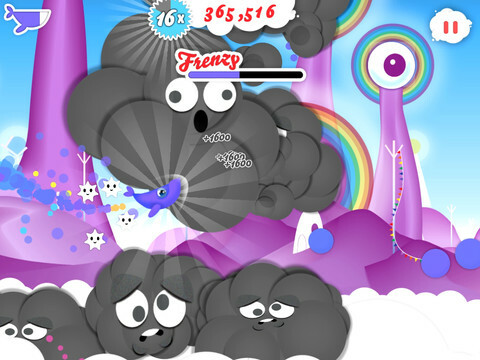 As the player progresses through the story, the number of clouds to avoid will grow steadily, which progressively increases the difficulty level. Many players might be wondering how a whale can possibly be flying. The Whale Trail app actually has a magical rainbow that keeps the whale afloat. In case it wasn’t already evident, this app is incredibly imaginative and doesn’t follow many traditional video game tropes. The player’s rainbow trail is continually losing power and must be kept energized with the collection of the brightly colored bubbles that are found across the player’s path. Additionally, the dark clouds will drain the player’s power very quickly and can end a player’s run quickly if they aren’t careful. One of the things that add to the program’s charm is the music. The background tunes are comprised of upbeat folk music tracks written exclusively for this game that really fit the app well. The sound effects also do a great job of keeping the player interested in the app, as they offer up satisfying beeps and bloops to mark the player’s progress. Conversely, the sound for the clouds really make them seem menacing and give the player another reason to want to stay away from them. Overall, Whale Trail’s gameplay is simple yet addictive, making it the perfect kind of game for an iPhone. This is the kind of app that will have players coming back again and again to try and improve their scores. One of the only real downsides to the app is that completing each session can take quite a bit of time. Additionally, the app is a bit too easy during the beginning levels. However, these aren’t really huge complaints, and the modest price tag makes these flaws easy to forgive. AppSafari review of Whale Trail was written by Darius Reimm on October 25th, 2011 and categorized under Action, App Store, Arcade, Featured, Fun, Games, Scrolling Shooter. Page viewed 4261 times, 1 so far today. Need help on using these apps? Please read the Help Page.